This month’s issue explores how to make the most of a small garden, with reliable plants and clever design ideas to create the perfect relaxation zone. Our three reader gardens are all tiny too: dazzling examples of how to create the perfect leafy oasis that’s packed with personality. Elsewhere, there’s advice on filling border gaps with frothy filigree plants, buying the right secateurs and how to welcome home hungry migrant birds such as warblers, swifts and swallows. Plus all your favourites! Garden to visit Arundel Castle in West Sussex provides a dramatic backdrop for a spectacular garden. Don’t miss the tulip festival this month! Boost flower power with these reblooming shrubs Save up to £18! Garden Answers’ April issue is all about making your gardening life easier. In our Easy pleasers feature we’ve flagged up our favourite plants that will take care of themselves, from happy-go-lucky self-seeders to non-nonsense shrubs and perennials. We also reveal our top 10 gardening hacks to make light work of chores such as watering, tool care and protection from pests. Subscribe to Garden Answers Take out a subscription and we’ll send you a snazzy pair of Burgon & Ball secateurs worth £19.99. They’re orange so you won’t lose them! MARCH ISSUE ON SALE 30 JAN! Create a spring sensation with our timely advice on the buds, bulbs and blossom that will give your garden a colourful new look. Plus – ideas for creating privacy, how to grow perfect patio tomatoes, gardening with hungry wildlife and three gorgeous reader gardens! Prune now for colourful stems Encourage bright new growth with your secateurs! Boost your winter flower count this month by planting dainty-looking bulbs, pretty shrubs and perennials that flower in the depths of winter. This issue we bring colour and fragrance to your borders and choose our favourite romantic roses to plant for Valentine’s Day. There’s seasonal inspiration from our three reader gardens, advice on how to choose and grow potatoes, design solutions for a formal front garden and an exciting wildlife feature on sparrowhawks, plus all your favourites! Add romance with a rose Valentine’s Day is the perfect time to plant one! Garden to visit With its historic beginnings, vibrant bulbs and hellebores, Mottisfont is a must! Snowdrops in the green twinpack 250 bulbs for just £39.96! Boost your winter garden with colourful evergreens – here we explore the many ways they contribute to structure and drama, including grasses, topiary, hedging, and colourful foliage in silver, green and gold. Also this month – how to get ready for frost, make birds welcome with nextboxes, the art of planning your veg patch and winter planting ideas to brighten up the patio. Border Rescue Red cornus stems make a flamboyant statement, but what can you plant with them? 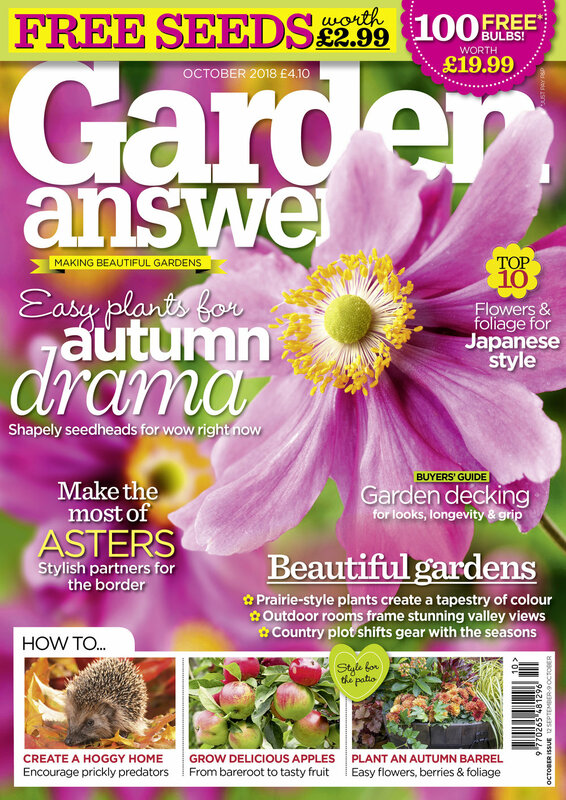 Subscribe to Garden Answers Enjoy this magazine with a third off the price when you subscribe – it makes a brilliant Christmas gift too! This month’s issue is full of festive excitement, from creating your own winter wonderland with plants for colour, shape and texture, to choosing your favourite Christmas gifts for green-fingered friends and family. We explore the colourful world of dogwoods and what to plant with hellebores to brighten up the patio. Plus: we look at the flavour bonus you get when growing heritage fruit & veg, and our new garden design guru creates a winter walk in a small suburban plot. Four duo fruit trees Perfect for any size garden – save £19.99! Meet the stars of late summer in this month’s Garden Answers. We show you the gorgeous gap-fillers that will keep borders brimming with colour right into autumn, the top 10 grasses to create drama and hardy geraniums for reliable flowers month after month. Turn plastic guttering into a ‘living wall’ and create a sensational September border with dahlias and verbena. Create a frog and toad abode for the garden and start off autumn crops now for months of delicious homegrown produce. Our August issue is full of clever planting ideas wherever you garden, with plants for shade and sunshine, clay and sandy soils. Get the jungly look with our top ten exotic-looking plants, or go for a suburban prairie look using grasses, flower spires and daisies to create a tapestry of colour. Choose the right flowers for a planting palette that will last all year round. We lead you through colour spectrum, revealing reliable plants to compliment existing border schemes. Plus: how to use pink and orange to wow the neighbours; flowers you can grow and eat; how to enjoy nocturnal wildlife; and a Moroccan garden design that uses exotic plants and colourful accessories to pack your plot with Eastern promise. Learn to love pink and orange Sock it to the neighbours with an outrageous clashing border. We dare you! Celebrate cottage style with laidback, flower-rich borders, must-have spires and blowsy blooms for a haze of colour, self seeders and delicious potager crops. This issue we look at the timeless appeal of this classic style, with cottage garden groundcover, a romantic summer border, butterfly plants and the wildlife allies that will help banish aphids for good. Celebrate Suburban cottage style Forget thatched roofs and picket fences – you can get the cottage look wherever you garden! Grow unbeatable beetroot These rotund roots are such a useful kitchen standby it’s lucky they grow fast! Garden view Cut flowers make a home, declares Helen Billiald. So don’t hold back when sowing them! As flower show season gets under way, don’t miss our Chelsea Special issue! It’s packed with everything you need to create show garden chic at home – the must-have plants, designer sketches, exclusive interviews, behind-the-scenes photos and shopping ideas to get the luxury look on a budget. PLUS reader gardens and all your favourites! The search is on to find our Gardeners’ Garden 2018 There’s £2,250 of Cobra equipment to win! MAY ISSUE ON SALE 28 MARCH! Make the most of a small garden with the May issue of Garden Answers. We bring you design solutions and planting ideas, plus advice on how to avoid the ‘boxy’ look. We advise on how to sort a cluttered pot collection, feed fledgling birds and how to grow beautiful runner beans. Plus there’s a chance to win National Trust goodies in our crossword. Feed your fledglings How can we help our garden birds raise a brood successfully? Our April issue is dedicated to planning the perfect spring border - using zingy green perennials, colour-coordinated tulips, woodland flowers and fresh new foliage. There are dramatic plants with delicious chocolate names for Easter weekend (!) and a chic new white border scheme to try at home, using bells, trumpets, hearts and star-shaped flowers. Our three reader gardens are full of inspiring planting schemes and design ideas, and there's plenty of low-maintenance design tips in our Design Solutions feature. You can find out how to gain success with sweetcorn and summer squash, and we reveal the secrets of the dawn chorus. Create seasonal sparkle this month with the earliest bulbs and shrubs for fragrance. We focus on frost-proof magnolias and how to make a statement with architectural annuals. Boost your garden’s butterfly appeal by catering for caterpillars and colour-up mealtimes with gourmet roots. Our February issue is full of planting ideas to take the chill off the garden in winter. We look at the plants that can bring a little romance, scent and frosted pastel colours, dainty Cyclamen coum and a vibrant border scheme as bright as any rainbow. Our reader gardens are full of structural evergreens and grasses, crocus and snowdrops for inspiration. We've got tips on how to create a bird cafe and how to grow foolproof crops in your gourmet garden. 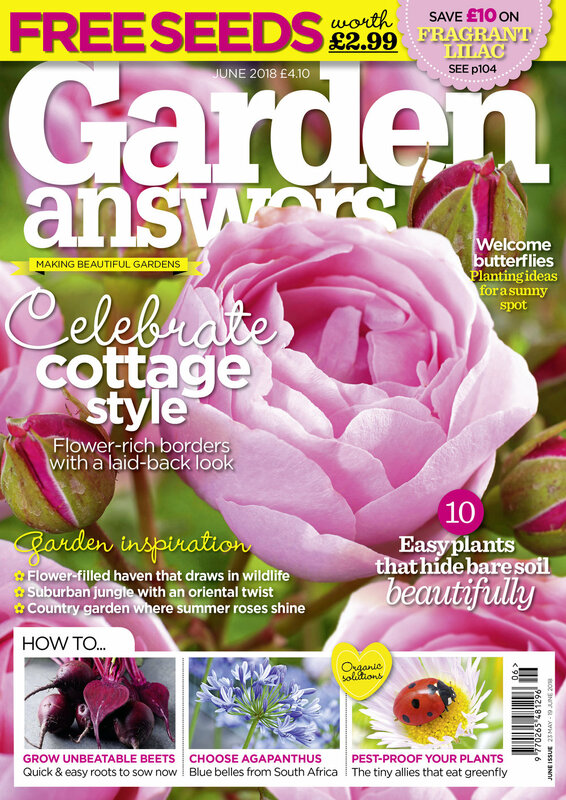 Subscribe to Garden Answers ...get the next 3 issues for just £5! Ask Garden Answers Our experts help you get the most from your garden – send us your questions! DECEMBER ISSUE ON SALE 8 NOV! Enjoy more wow this winter! This month’s Christmas Special issue is full of planting ideas for the winter season. From exciting evergreens that will keep the garden looking colourful, to heavenly hellebores and plants for a dazzling flash of winter red. We learn the secrets of Britain’s finest winter gardens too: we’ve interviewed the experts at Anglesey Abbey, Bodnant, The Sir Harold Hillier Gardens, RHS Gardens Harlow Carr and Rosemoor to find out how all of us can create more wow in the cold season. There are plenty of green-fingered gift ideas too – from fun stocking fillers to pretty but practical gardening tools. Plus all your favourites!